You couldn't find a more relaxed couple than Tamara and Rob. Tamara grew up on Waiheke, (yeah, we're all a pretty relaxed bunch over here) and found her love over in the UK. They travel the world working on Super yachts, based in some of the most desirable locations on the globe. 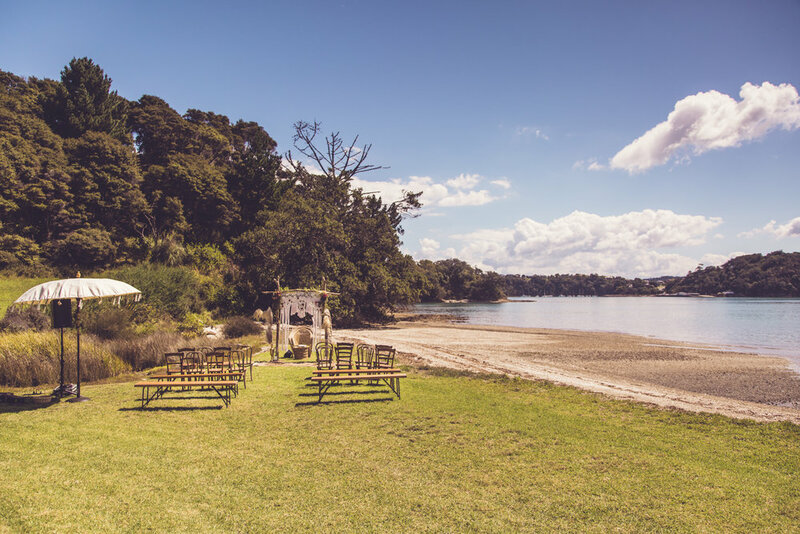 So when it came to choosing their venue for a destination wedding, Honeymoon Bay on Waiheke Island ticked all the boxes, offering a super relaxed atmosphere, absolute beachfront location with a quintessential kiwi vibe. Relaxed and informal was what these guys were after, and a place to showcase the best of New Zealand to their international friends and family. 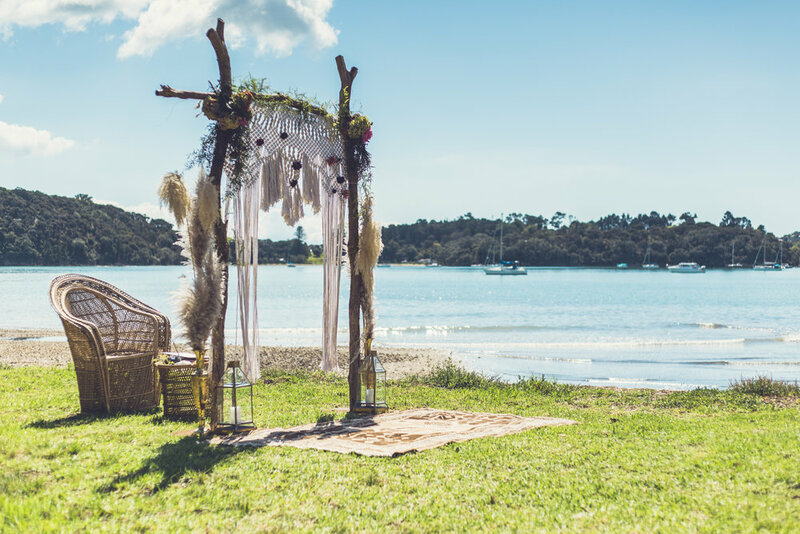 We fell in love with Tamara's style plan for her wedding, it was a mix of some of our favourite things, a Teepee, lots of lounges by the sea, a macrame ceremony arch all wrapped up with a relaxed coastal feel. Yay! It was also perfect timing, as we had just been up in Bali and India on a buying trip for the hire business, so our studio was filled with gorgeous pieces to fit the brief! It was such fun planning this wedding with these two, and we were delighted to have TopKata over on the Island to help create this magical day. 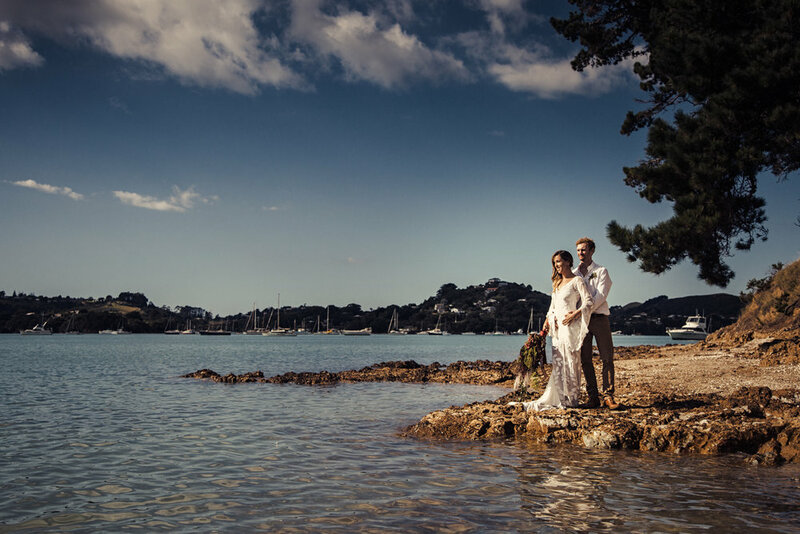 The wedding was a stunning balmy day in March, one of the driest and warmest months on Waiheke. 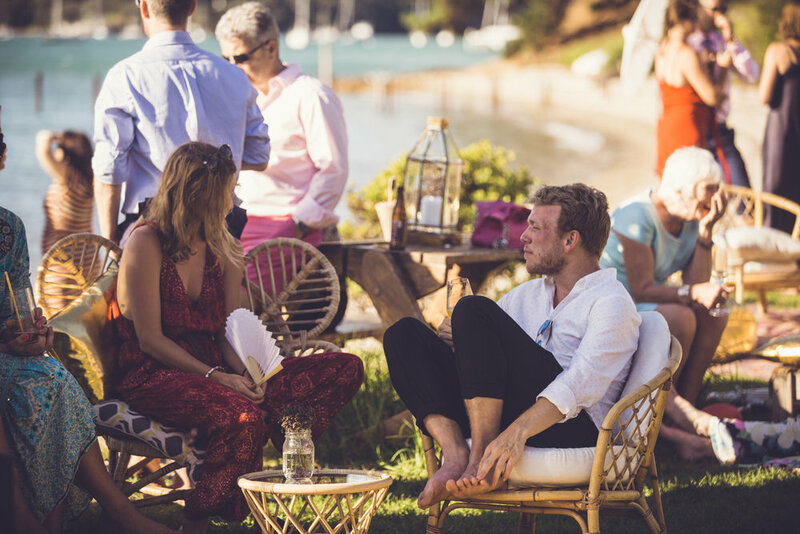 Guests were quick to kick off their shoes, wade into the sea drinking champagne and lounge around on the lawn soaking in the afternoon sun together. Tamara looked amazing as she walked across the lawn in her incredible boho Rue De Seine gown, barefoot and hair blowing in the wind. They were married in front of a macrame arch backdrop with wild flowers and a persian rug. The afternoon continued with live music and canapés, followed by platter style dining inside the famous TopKata TeePee. 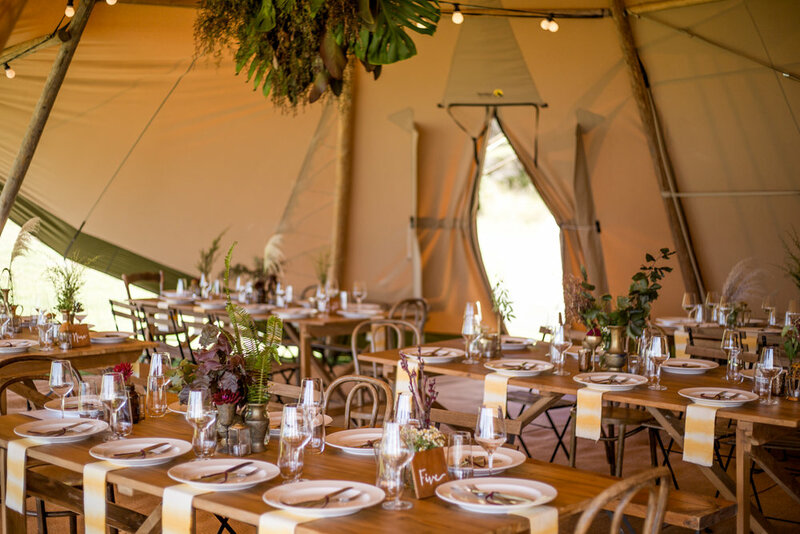 Florals and greenery installations were created by our good friends at Wildflower, catering with Gill Stotter Catering, gorgeous tableware from Lockhart & Smith, decor and furniture was through our My Waiheke Hire range. I always love the personalised and custom made details, so we were delighted when Tamara suggested dip dyed napkins in her favourite colour yellow. This was definitely a highlight of the Summer, with such unique elements and an incredible couple to work with. Read more about Tamara and Rob's wedding day over at Viva Magazine. My Waiheke © 2018 All rights reserved.